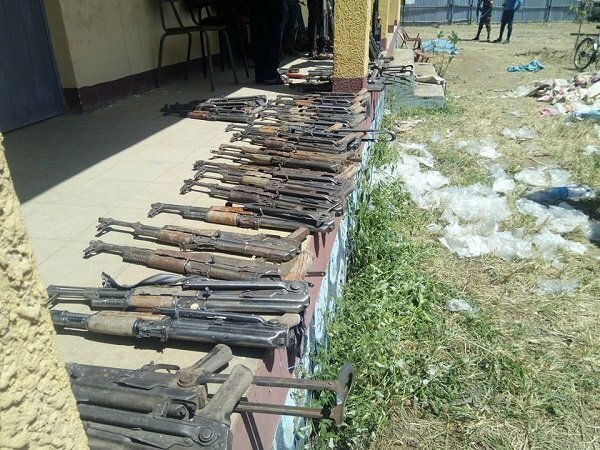 Hundreds of illegal arms which seem to be smuggled from Sudan is seized in Amhara region of Ethiopia. 98 AK 47 and 294 Turkey made handgun (all reportedly illegal) is recovered from an oil tanker truck that fell over in Gendwuda town, Amhara regional state, reported today Amhara Mass Media Agency (AMMA). As well, 120 bullets and 106 bullets magazine is seized. It fell over as it was trying to avoid to hit a goat and it was after that the authorities in the town discovered that the tanker was loaded with illegal arms. Aragaw Azanaw, the town’s security office head, is cited as saying that police in the town is working with the community to control illegal circulation of fire arms but security authorities are not authorized to search oil tankers which is facilitating smuggling in arms. Illegal circulation of arms is increasingly becoming a problem for authorities in Amhara and Oromo regions of Ethiopia since recent months. One Response to "Hundreds of illegal arms originating from Sudan seized as oil tanker truck fell over"
Why Ethiopian government do something about the tanker?? it is know that they are smuggling weapon.